It would imply the regeneration of mankind, if they were to become elevated enough to truly worship sticks and stones. It's been a pretty interesting couple of days, as local Krogers patrons registered concern about a single product lots of people seem to like. Snowville Creamery's milk can cost twice as much as other brands, depending on sale situations, but people are devoted. For an old dude like me it's reminiscent of childhood days, not so much of glass bottles the milkman brought to our doorstep---and which we washed out and returned for refill each day. It's because of the cream on top, something I never thought I'd experience again! Mom preferred we shake up the bottles before the first pour, but sometimes I couldn't resist stealing all the cream onto a bowl of Wheaties. Yum! It really was Breakfast of Champions then! So Thursday and Friday there was a flurry of activity as word got out that for some reason Kroger's had reduced Snowville's shelf area and hiked the price by a buck. As people all over Southeast Ohio called, emailed, and went into the Athens store to contact management, various stories began to emerge. What we learned, if we didn't know already, farm and pharm are hotly competitive...and what the grocer's got and the doctor prescribes are similarly fought over. Lots of people are involved and it's complicated. For instance, it's not unusual in the aisles of Krogers or in the doctor's waiting room to observe a salesperson pitching away to a department supervisor or the receptionist through the little window. I'll never forget sitting in Dr. Rothstein's one afternoon, and watching this woman push the latest mood-altering capsule. She was inviting the whole crew out to dinner---"someplace special this time"---and then pointed to her clothes which, she said, were specially designed to match the gay colors of the pill. Can you imagine the money involved to deck out the Merck sales force in this wardrobe, plus dinners at the resort? Wonder who pays for all that. The same goes at the supermarket, as sales people try to convince employees to change around the displays of their products. It's high pressure, and you can watch it out in the open, "free" market all you want to. Receptionists and Krogers folks, to their credit, look embarrassed and nervous while this stuff goes on. They don't want to make a mistake that their supervisors will get angry about, but they have a whole load of work to do---and it's hard to get rid of these corporate reps. In Krogers this has been especially true since the store has been expanded and redesigned here. Now we need hiking boots for the spaciousness, and lots of patience as we trek around looking for where the products are from day to day. PLUS food prices are soaring at the same time! So maybe all of this motivated so many of us to get busy about Snowville. It appears it was over within a single day or 2...but quite possibly it was accomplished from inside Krogers as well as from our action. From what I hear, and maybe I'd better keep the source anonymous, there are not only salespeople pressuring for shelf space changes. There also are Kroger regional supervisors in the Athens store a lot to oversee the remodeling. They need to make sure the fussy preferences of agribusiness are taken care of, including setups at the end of aisles and displays that will keep you trudging around the store buying lots more stuff than you came in there for. And of course there's the Kroger line of items...like Krogers milk. 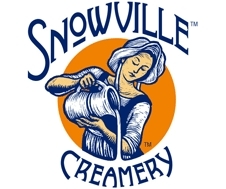 So the Krogers dairy guy gets a supervisor from out of town telling him he's never heard of Snowville. What's that! We got Krogers milk on sale, stick Snowville out of reach and raise the price. So the dairy super has to do it, and then the regional manager leaves the store and goes back to the big city. What happens next, and this is just hearsay mind you, is the local Krogers then put everything back the way it was. Those of us who visited the store during the last couple days came back with different reports of what was going on, depending on what level of the process we happened to observe. When I went in Thursday afternoon, the milk was still hidden away on the top shelf next to Krogers on-sale brand and marked at $3.99 a half gallon. But when I scanned it, it came up $2.99. I mentioned the discrepancy to the clerk and he just smiled. By yesterday afternoon, Snowville still was on the top shelf next to the sale but priced back to $2.99---and much more product had arrived which was featured prominently at the natural foods section where it used to be. So maybe if the regional guy comes back to check it out, he'll still find Snowville stashed high up and nowhere---and perhaps he won't notice the big display elsewhere in the store. Please remember I'm making this up and I'm not representing Kroger policy, but we are aware our local store manager is very interested in local produce and commerce. He knows Athens people strongly support local initiatives, and never more so than in the face of something like the big box just down the road. Seamans and The Farmacy know this too, and so these stores feature local stuff---because we'll go there to get it instead of to the box. These stores are doing everything they can to stay alive. We should be grateful to all the people who got involved, even though maybe Krogers was handling the whole thing anyway. We certainly didn't do any harm...and it's helpful to remember this kind of thing is going on all the time with different products. Of course our local entrepreneurs don't have the clout of these big companies, so we should be proud of who cared about this situation. Bob Sheak even provided a model for a letter or email to Kroger headquarters. Susan Gwinn gave support, as did Jennifer Simon of the Chamber of Commerce. Mary Beth Lohse represented Sierra Club and Michelle Ajamian visited the store for AthensGrow. The Warmkes up at Blue Rock Station offered help, as did Kathy Jacobson at Broadwell Hill. And of course there was our anonymous correspondent from inside the store itself. And maybe many people we don't know about. So...it's 6:00 and I think a perfect time for a bowl of cereal---with cream off the top. An Ohio dairyman is on a crusade to put cows back on pastures and bring the flavor back to milk. Warren Taylor owns and runs Snowville Creamery, and he's trying to make milk the way it was made 40 years ago, when, he insists, it tasted better. A lean, hyperactive 58-year-old dairy engineer, Taylor aspires to be "the Che Guevara of the American dairy industry." He bounds from place to place, pouring forth his philosophy of how he plans to transform the industry, starting here at his milk plant in Pomeroy, Ohio. "I built Snowville Creamery to prove to the American dairy industry that the reason our children have had a 30-year continuous decline in their consumption of milk is not entirely Coke and Pepsi's fault, but because the dairy industry has been delivering a continuously declining quality of milk, in terms of its freshness and taste," Taylor says. First, most of his milk is sold 48 hours out of the cow, and he delivers no farther than an eight-hour distance from the dairy. Second, his milk is not homogenized; the cream rises to the top, and you have to shake it up before pouring. Third, his milk is pasteurized at a lower temperature — 165 degrees. The industry standard is 175 degrees, which Taylor believes diminishes taste. Today, the popular "ultrahigh temperature" or "ultrapasteurized" milk is sterilized at 280 degrees, a process that trades flavor for long-distance marketing and long shelf life. Most important, Taylor says, his milk comes from cows that dine on grass or hay. "This is in stark contrast to the vast majority of milk in America which is made from cows confined in barns, partly so they can be milked three times a day, and are fed a diet that is predominantly corn and soybeans. Those cows produce about twice as much milk a day as the cows here in a pasture-grazing situation," Taylor says. He gets his milk from 235 brown Jersey cows that graze on a farm owned by his neighbor, Bill Dix. Half of Dix's milk goes to Snowville Creamery, which is housed in an industrial-looking metal building right on the premises of his farm. Taylor is by no means the only dairyman in America doing it this way. The editor of Graze magazine estimates that 5 percent of producers graze their cattle on grass. But like the rest of American agriculture, the dairy business is moving toward fewer and larger farms and is dominated by a handful of giants. In fact, the U.S. Justice Department is currently investigating whether the influence of the huge co-op Dairy Farmers of America and the huge processor Dean Foods violates antitrust laws. It's also true that most dairies are interested in one thing: producing as much milk as cheaply as possible — especially now that low milk prices are driving some dairymen into bankruptcy. Generally, milk comes from confined animal feeding operations, where large herds live in feedlots and are milked several times a day. "You can put 'em out and let 'em eat grass and let 'em do whatever, and produce half what they're doing. But where are you gonna put 2,600 cows on one place? How many acres do you have to have, to have 2,600 cows? And how do you keep up with that?" asks John Woelber, a mega-dairyman in Belen, N.M. The dairy industry is not really paying attention to Taylor's one-man insurgency — at least not yet. Chris Galen, spokesman for the National Milk Producers Federation, rejects the idea that his members compromise taste for quantity. "Of course, flavor is in the eye, or at least the tongue, of the beholder, and so if people detect a difference in taste, I would not tell them they're not detecting it. We all know the placebo effect is quite powerful. If you're paying $6, $7 or $8 a gallon for milk versus $3, you might think it tastes better simply because it costs more," Galen says. Is Snowville Creamery a quaint creation of what concrete-stressed urbanites think a country dairy should look like? Or is it a true harbinger of what's possible? And is Taylor a prophet? Or is he, in Galen's words, a "clever marketer?" "There's only one way I can compete with milk that cheap, and that's to make milk that is clearly different and better," Taylor says. To test his boast, Taylor was followed to the Whole Foods Market on P Street in Washington, D.C., where the manic milkman was giving samples in front of the dairy case. His milk sells for $3 a half-gallon. A woman in a down jacket picking up some groceries after work accepts a cup of his skim milk. "Oh, that's good!" she says before asking where she can find it. Since beginning operations two years ago, Snowville Creamery has been expanding production about 5 to 10 percent month over month. Now with 80 outlets, mostly in Ohio, Taylor says it finally became profitable this month. Washington, D.C., is their newest and farthest market. A middle-aged woman pushes her cart up to the Snowville sample table and takes a cup of whole milk. "Oh, that's so good," she says with gusto. "My mom used to get this stuff from a farm near us when I was growing up. It's like that." "Oh, well," he says. "I'm a dairy evangelist."